George Roger Waters (born 6 September 1943) is an English musician, singer-songwriter and composer. 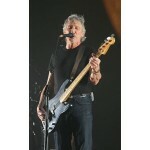 He was a founder member of the progressive rock band Pink Floyd, serving as bassist and co-lead vocalist. Following the departure of bandmate Syd Barrett in 1968, Waters became the band's lyricist, principal songwriter and conceptual leader. The band subsequently achieved worldwide success in the 1970s with the concept albums The Dark Side of the Moon, Wish You Were Here, Animals and The Wall. Although Waters' primary instrument in Pink Floyd was the bass guitar, he also experimented with synthesisers and tape loops and played rhythm guitars in recordings and in concerts. Amid creative differences within the group, Waters left Pink Floyd in 1985 and began a legal battle with the remaining members over their future use of the group's name and material. The dispute was settled out of court in 1987, and nearly eighteen years passed before he performed with Pink Floyd again. It is estimated that as of 2010, the group have sold over 200 million albums worldwide, including 74.5 million units sold in the United States. Waters' solo career includes three studio albums: The Pros and Cons of Hitch Hiking (1984), Radio K.A.O.S. (1987) and Amused to Death (1992). In 1986, he contributed songs and a score to the soundtrack of the animated movie When the Wind Blows based on the Raymond Briggs' book of the same name. In 1990, he staged one of the largest and most elaborate rock concerts in history, The Wall – Live in Berlin, with an official attendance of 200,000. In 1996, he was inducted into the US and the UK Rock and Roll Hall of Fame as a member of Pink Floyd. He has toured extensively as a solo act since 1999 and played The Dark Side of the Moon in its entirety for his world tours of 2006–2008. In 2005, he released Ça Ira, an opera in three acts translated from Étienne and Nadine Roda-Gils' libretto based on the early French Revolution. On 2 July 2005, he reunited with Pink Floyd bandmates Nick Mason, Richard Wright and David Gilmour for the Live 8 global awareness event; it was the group's first appearance with Waters in 24 years. In 2010, he began The Wall Live, a worldwide tour that features a complete performance of The Wall. During this tour, at The O2 Arena in London on 12 May 2011, Gilmour and Mason once again appeared with Waters, Gilmour performing "Comfortably Numb", and Gilmour and Mason joining Waters for "Outside the Wall". He has been married four times and has three children. In 2004 he became engaged to actress and filmmaker Laurie Durning; the pair married in 2012.